Today I will begin with two Tigre masks that are small by current Guerrero standards. When I bought these masks it was my impression that they were used in la región Tlapaneca, an area within the Costa Chica of Guerrero that is the traditional home of the Tlapaneco Indians. The Costa Chica, or “little coast,” refers to portions of the Mexican states of Guerrero and Oaxaca that border on the Pacific ocean. Amusgos, Mixtecos, and Nahuas also inhabit this coastal area. 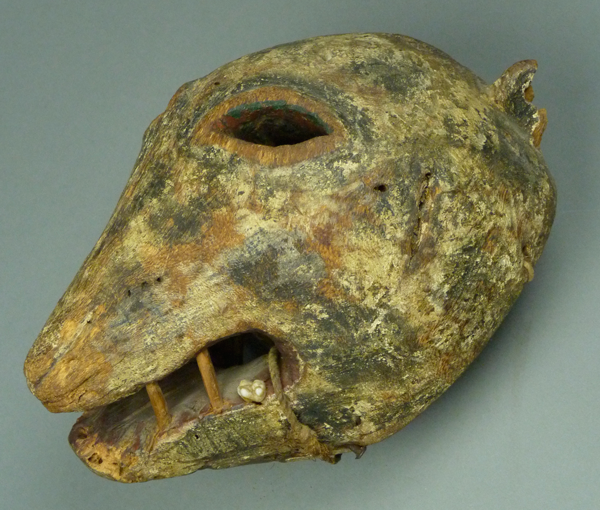 Masks of this scale that depict other wild animals such as badgers, coaties, and wolves have also been collected in this region. I had originally assumed that these animal masks were invariably used in regional versions of the Tecuanes dance, but further research suggests that they are often absent from that dance, and that they also appear in their own dance—el danza de los Tejones—in the absence of the jaguar. Although the literal meaning of tejón is “badger,” its meaning is sometimes generalized to include other wild animals. The evidence for their appearance in the Tejón dance comes from the adjacent territory of the Amusgo Indians, where one finds similar animal masks, either dancing with more normal sized Tigre masks in the danza del Tigre y los Tlaminques (the Jaguar and the Townspeople), or alone in La Danza de los Tejones. I don’t even know whether the masks in today’s post are still used in the Tlapaneca, because there is so little printed or photographic documentation about this variant of the dance. The principal municipios (counties) occupied by the Tlapanecos include those of Acatepec, Atlixtac, San Luis Acatlán, and Zapotitlán Tablas, while there are smaller populations in Atlamajalcingo del Monte, Metlatonoc, Tlapa de Comonfort, Ayutla, and Acapulco. The bottom line is that there have been many local variations of the danza de los Tecuanes and the danza de los Tigres, however with television, cell phones, YouTube™, and broader travel within the area, it would seem that a more generic form is emerging. 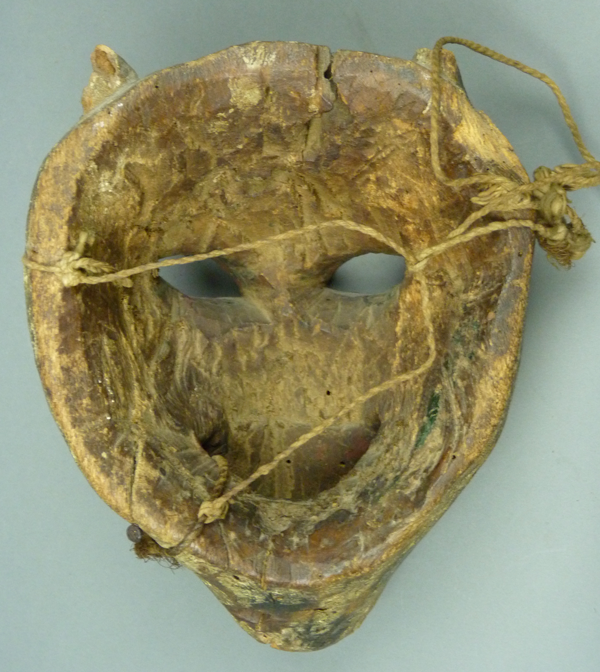 The masks in today’s post may reflect a local tradition that is no longer active versus the possibility that it survives in some isolated areas. Here is a Tigre mask that I purchased in 1971, in Santa Fe, New Mexico. It has painted spots. Soon after I bought it I noticed that it was shedding fine sawdust, a sign of infestation by powder post beetles or a similar wood chewing insect. I was told to dip the mask in Woodlife™, a wood preservative, in order to halt the infestation. One ear was severely damaged while the other (the left ear) remains more intact to demonstrate its form. For more on the subject of dealing with insect infestation, see the FAQ section. This mask is 9 inches tall, 6½ inches wide, and 5 inches deep. From this angle one can get an idea of the ear design, despite the damage. The Woodlife treatment made the patina darker, but even before that treatment the back was rather dark from prolonged use. 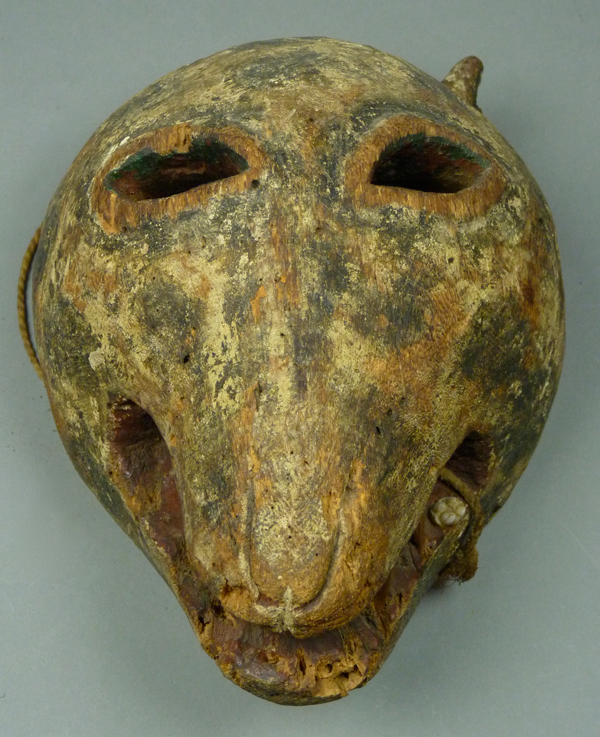 This week I will continue my discussion of Tigre masks from Guerrero. The first two masks are examples of the famous Olinalá Tigres, the highly distinctive jaguar masks from Olinalá, Guerrero. The first is adult-sized and the second was worn by a child. To introduce these masks, here is a YouTube™ video from Olinalá. Here are the two masks together. Today, continuing my plan to post photos of excellent traditional masks from the Mexican state of Guerrero, I will show masks of Tigres, the Spanish word used to refer to jaguars. According to Santano González Villalobos (2005), in Danzas y Bailes Tradicionales del Estado de Guerrero, there are various dances in this state that include dancers wearing jaguar masks. These include el danza de los Tlacololeros (pages 66 to 84), the danza de los Tecuanis or Tecuanes (pages 85 to 91), la danza del Tigre y los Tlaminques (pages 91 and 93), the famous danza de los Tigres de Zitlala (pages 92 and 99) in which dancers wearing leather helmet masks batter one another with clubs made from coiled rope, and la danza del Tigre (page 93). I will begin by showing a leather Tigre mask from Zitlala, Guerrero. It is in the collection of Helmut Hamm, a recent visitor to this site from Germany. It looks like a good one. Here is a link to a Youtube™ video showing the Tigres in Zitlala. Their dance and related suffering is said to represent a petition for rain. Last week I discussed a group of Diablo masks from the Mexican state of Guerrero that were typical of the area around Tixtla. 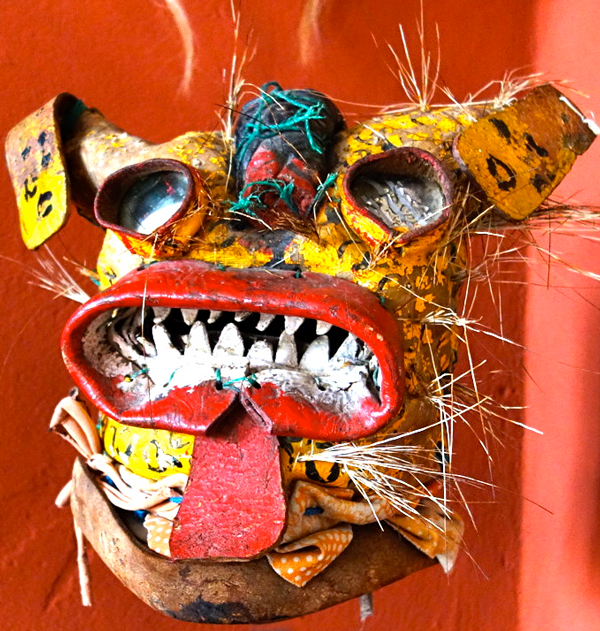 Today I will present additional Diablo masks from Guerrero that demonstrate other styles. In the catalogue prepared by María Teresa Sepúlveda Herrera listing the masks from Guerrero in the collection of the National Museum of Anthropology, in Mexico City, there is a trio of masks that resemble one another. 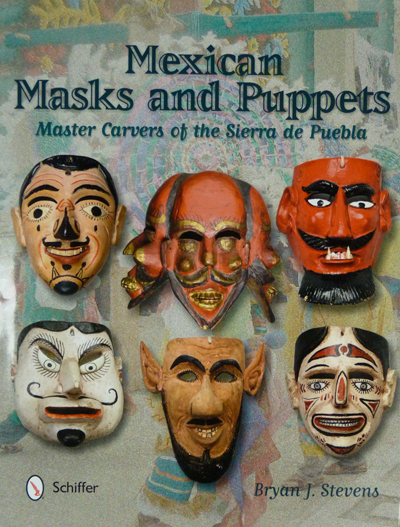 These are masks #101, 102, and 103 (pages 169 to 172), which were collected in Apaxtla and Cuetzala de Progresso, two neighboring towns east of Taxco, Guerrero. According to the Calendario de Fiesta Populares (1988, 83), there are many dances in Apaxtla, of which only one includes a Devil, the dance of the Tres Potencias (described in my post of 9/22/2014). The information for Cuetzala is less specific. 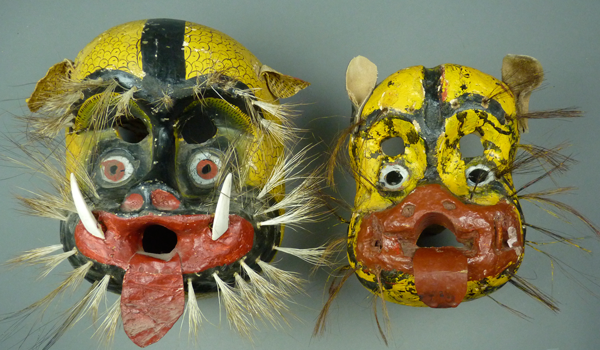 I am assuming that all three of these masks were used in the Tres Potencias dance. I will begin with a mask that most closely resembles #101, the one from Apaxtla. I obtained my similar mask from the Craft and Folk Museum, in Los Angeles, in 1995. It was said to have been collected in Tlapa, Guerrero, a town to the east of the two just mentioned. The Tres Potencias dance also occurs in that town, according to the Calendario (1988, 89). Of the devil masks in my collection from Guerrero, this is certainly my favorite; it is majestic.